THEY improv is a leader in training and bonding for multi-national companies and provides improv comedy, game shows and murder mystery dinners for entertainment options for a variety of groups and gatherings throughout the US and Canada and now throughout the Arabian Peninsula. Keeping quality people within an organization and showing the people who you work with that they are appreciated is a tough proposition. Often employers look to corporate event entertainment to do just that. THEY improv is focused on doing just that, and has proven successful for many clients in the United States and abroad. 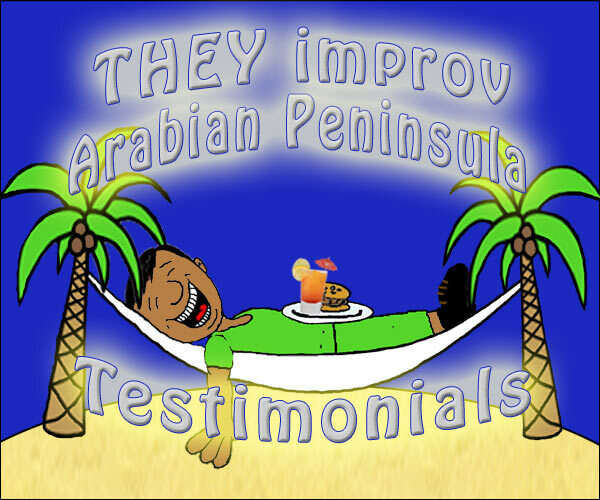 THEY improv now works with performers to bring our performances to your company in the Arabian Peninsula. Here are a few testimonials from just a handful of our happy clients. I just wanted to let you know what it pleasure it was to have THEY Improv at our holiday party! The crowd enjoyed the performance and we received a lot of positive feedback...We will certainly keep you in mind for future events and will use this information to gauge our requests. I wanted to write and send along a big thank you from the team for such a great event. Everyone was really engaged, and it definitely loosened the group up and opened up the lines of communications. We will definitely keep you all in mind for future events. It was really a great event. Big thanks to you both! I'll be sure to recommend / evangelize this going forward. I did not have a chance to properly thank you on Thursday. The session went really well and you did a fantastic job. It was a great way for us to end a three-day session. I appreciate you spending so much time with us. The team had a great time and you received rave reviews. I hope our paths cross again. We at Hearst Business Media really appreciate the great team your company provided to us for our Team Building event. It was truly a complete success thanks to your facilitators Joe, Jay and Erik. The day was full of team building exercises that focused on all the aspects we wanted to address such as interpersonal communication, motivation, innovation and being more accepting of our colleagues' ideas. We could not have done it without the exceptional professionalism, expertise and charisma that Joe, Jay and Erik brought to the table. Everything that was discussed during our event, whether in fun or as a post activity discussion has really triggered our positive thinking, and we're working on implementing what was learned. We are very appreciative of your assistance and wish you and your entire staff all the best. We will definitely keep you in mind for future events as well as recommend your services whenever the opportunity arises. THEY improv helped make our sales conference a big success. Todd was a great facilitator, and soon had our group sharing stories and laughing aloud. Their team-building exercises were effective and entertaining, and their hilarious improv performance was a great way to cap off the day. I'd recommend THEY improv to anyone looking for a creative way to foster teamwork and camaraderie. Thank you so much for the work your group did for my team in July! My leadership team is a unique audience in that they are typically the ones who develop and implement train-the-trainer and other like events for their audiences. Your group was a perfect match to bring in for the directors. The format was relaxed, fun and entertaining! Thank you for a fabulous event! We appreciate all of the work and effort you put into this! The improv session was very good. The actors were skilled at their craft, engaging, and fun! I just wanted to thank you for the service provided in the RSA Event you did for us on June 21st. Everybody enjoyed the activity and you did a great job on helping us making it happen in record time. First and foremost, I wanted to thank you for the quick turnaround in organizing the entertainment for our event last week. I really appreciate the flexibility and getting things pulled together so quickly and seamlessly. Dave did a phenomenal job and our employees had a terrific time watching and participating. Just wanted to let you know how much we enjoyed the group that came out last night and performed for us. They were great! Everyone had a wonderful time! Would recommend it to anyone. The comedians were amazing and we loved the show! Thank you so much for pulling it off. We are a company of 500 and I will definitely be spreading the word about them. Aside from their excellent sense of humor, THEY improv has a great talent for judging crowd reaction and adapting quickly to please. Improv basics? Yes, but it is a small detail, that if neglected, can turn a fun and lively evening into an uncomfortable one in short order. 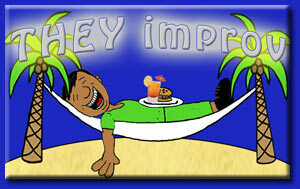 THEY improv is organized, professional and talented and we would highly recommend them to any company. Thank you THEYimprov, for entertaining the people of Case Construction Equipment, Inc.
You certainly wowed them. Not only was there much laughter and fun, but you managed to personalize the event for our Company, and allow us to say goodbye to a key employee with a semi roast, all improvised that night. Many, many comments the following week on how great your team performed. I will certainly recommend you to other departments. Graef, Anhalt, Schloemer & Associates, Inc. would like to thank you and the other members of the troupe that performed at the Quad/GAS 25th event that took place on October 3rd. The event was a huge success! Todd, I just wanted to thank you for a great job on this event. We have gotten a lot of good feedback from the team, they had a great time. THEY improv was a hit at our corporate dinner. They kept our clients laughing and involved throughout the entire show. What a great way to make an impression on our clients. Thank you again for helping us with an excellent performance last week. Matt and the team were fantastic and a great hit with our attendees! We will definitely keep THEY improv in mind for future events. I just wanted to send you a quick email to say thank you for helping arrange the improv game show last night - it was a big hit...and the guys were great! No doubt we will be using your services again in the future. We definitely appreciate THEY improv and the wonderful 'spin' you brought to our customer conference. We look forward to working with your team again in the future. THEY improv put on a wonderful show for Kennesaw State University's Comedy Night. Laughs all around and a great diverse cast. Very good at reading a crowd and gearing the show towards them at any given moment. Fun and interactive with the audience. Recommend highly.